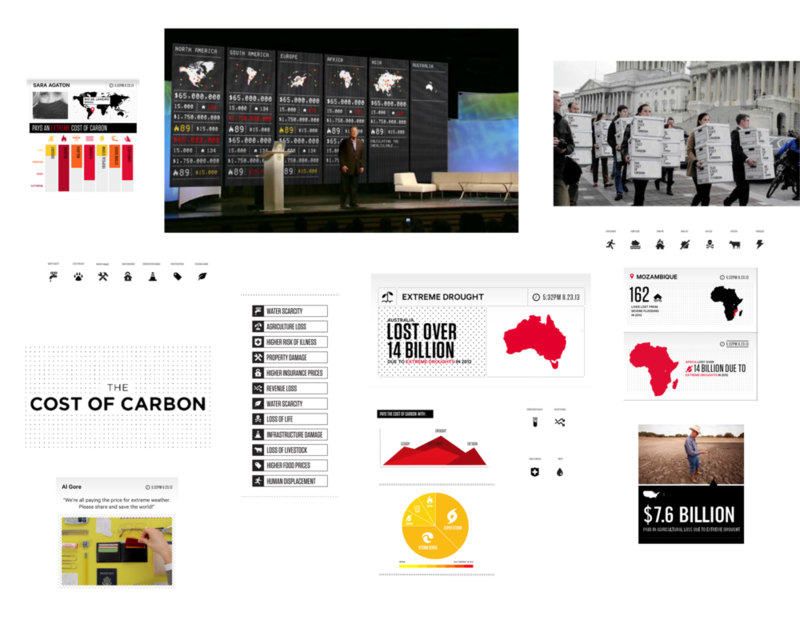 Studio Lo concepted and developed a digital tool for Al Gore’s Climate Reality Project. The costofcarbon.org allows someone to discover how carbon pollution is costing them in dollars, in lives, and in livelihoods. Carbon pollution is raising global temperatures, making weather disasters stronger and more frequent. These extremes are having devastating impacts on our planet and we’re paying in dollars, in lives, and in livelihoods. With TheCostOfCarbon.org you can find out how you are paying for carbon pollution and add your cost to the running global tally. When a user logged in with Facebook, they could see which of their friends live in severe weather high risk areas. We also designed tools to allow them to better understand what countries are bearing the brunt of our changing planet. But the coolest part of this tool allowed us all to flood the Twitter feeds of the top 20 global polluting countries. We delivered the message that we are all paying the cost of carbon pollution and that it was time to put a price on carbon. The Cost of Carbon Calculator generated over 129,000 global tweets to the world’s largest polluting countries, demanding they put a price on carbon. We need to act on cutting carbon pollution and the first step is beginning with a market price on carbon and a political price on denial.